Although used for thousands upon thousands of years, (See the Book of Job reference) today it seems like the use of salt has exploded in popularity more than ever. Try to find a seasoning or condiment that doesn’t advertise: “Made with all-natural sea salt.” Look and see how many pretty salt colors and flavors there are in your local spice shop or even grocery store. There are colored salts, flavored salts, smoked salts, salt cured meats, salt encrusted meats and fish, and on it goes. It’s even a hit in our desserts and coffees with “Sea-Salt Caramel” flavored everything. So it was no surprise to us when we discovered the wonderful world of salts has now permeated into the grilling arena. Yes there are a thousand and one ways to season any of your grilled fare to perfection with salts. Recipes abound that call for all sorts of extravagant salted marinades and rubs. In addition, there perhaps is no better way to prepare a juicy grilled steak than to season it with a minimalist approach of some coarse kosher salt and cracked black pepper. However we’ve recently come to embrace the fantastic salt infusing method of grilling on top of a Pink Himalayan Salt Block. For a salt lover, this is truly a unique way to go. Why is a Salt Block Great for Grilling? 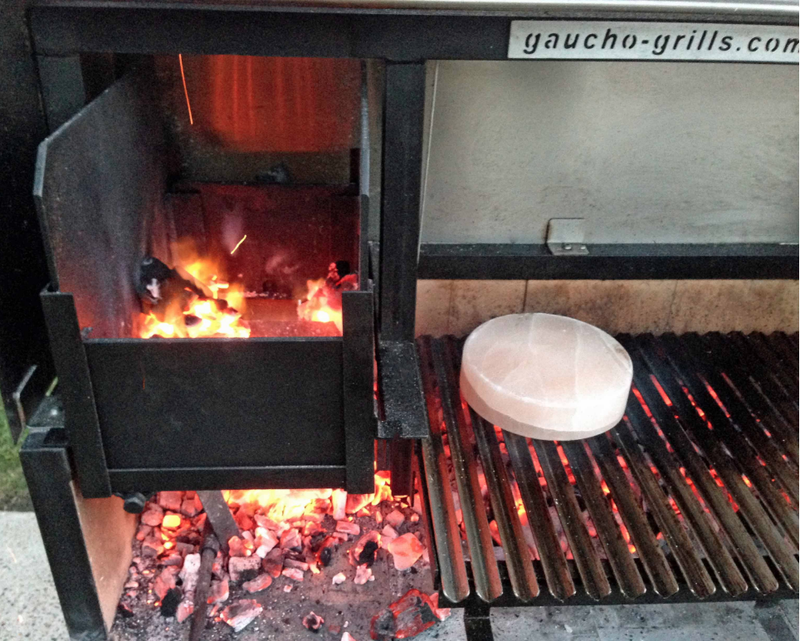 Asado grilling salt blockThe block of choice for us at Gaucho Grills is a 2” thick cut of pink marbled salt mined from the Himalayan mountain region. The thicker the block, the better the quality, the longer it will last, and the better the heat retention. Once the block is hot enough to make your meat sizzle, drop a piece of unseasoned (at least unsalted) meat of choice and cook on it as you would a cast iron pan. The block is good for most any cut of meat. Steak is amazing but we’ve tried chicken, fish and shellfish, all with fantastic results. With the meat cooking on the block, the juices will flow and you will start to see that pretty pink color start to turn brown as the salt block starts it’s seasoning process. Over time the meat juices will wear down the block, but a two inch thick slab of Himalayan salt should last quite a while. We’ve gotten entire grilling seasons out of one block even with weekly usage. The cook time of the meat will vary on the cut and type of meat, but mostly on your saltiness taste preference. For steaks I like to hit each side for 5 minutes to impart the salt level I prefer. This is the part that will take some fun grilling practice, finding that perfect salt level to your taste. Please know that the salt flavor will not just coat the top of the steak. The salt does infuse into the steak as it cooks. As the moisture of the meat releases, it draws in the salt flavor. That is why the heat is so critical. If the block is not hot enough, the meat will release its moisture but not sear properly. This will in affect draw in too much of the salt flavor and you will find your meat overly salty (we learned this the hard way with a bad scallop experience). If you feel that you’ve grilled with your block long enough and your salt level has been reached but your meat is still not done to your preference, simply take your meat off the block and finish it on the grill. You can even work that process in reverse. Meat can be started on the grill and then finished off on the block if you desire. cleaning parrilla salt blockAfter your fantastic grilled meal, it’s time to clean up your grilling area. With a Pink Himalayan Salt Slab, the cleaning is easy. The first step is the crucial one. Make sure, the block has cooled off enough that it’s safe to handle. These blocks retain heat very well and the block can be too hot to handle even if the rest of your grill has long cooled off. Once the block is cooled, wipe off any residue still stuck to the block. The Pink Himalayan Salt Block is another culinary tool in your arsenal that can enhance your grilling experience. There are other ways to use the block around the kitchen as well. Blocks can be heated in the oven and used to cook table side. The temperature retention of the blocks are amazing. The blocks hold cold just as well as they hold the heat. Try freezing your block and use it as a beautiful serving tray for meats and shell fish. The anti-bacterial properties of the salt block are a perfect safety tool to take advantage of when using as a chilled serving dish.